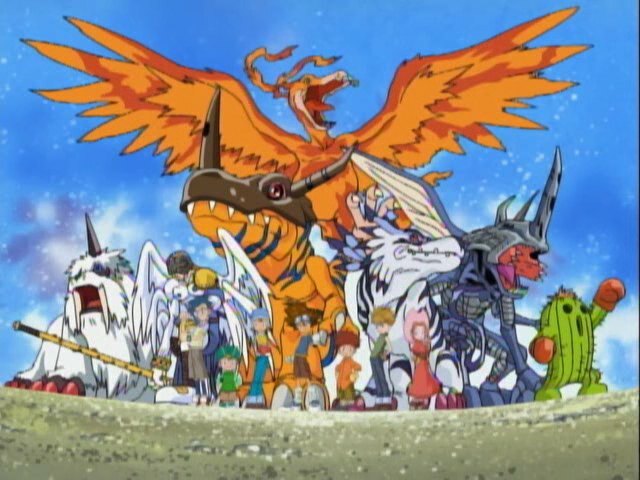 In this episode, the Japanese opening and some basic structure and insight as we begin Digimon Adventure. You're mostly here for the Japanese opening. I have never watched the first season straight through in its entirety. Thanks to reruns, I'm pretty sure I've seen every episode, just not necessarily in order. It wasn't until season two that I started watching regularly. In spite of this, I seem to remember little details about season one the most. Funny how the mind works like that. First thing's first, the age old question: dub or sub? My first inclination was to watch this in Japanese, approaching it as a refined anime nerd, getting past the silly dub ad-libs and tackling the raw show in its native tongue. That would have ended in disaster as I would inevitably go off on tangents about what was changed, what was cut and what was messed up in the dub. This would have been really bad as it's been ten years and I don't remember every little nuance about the English version. That's why we're here in the first place. Hence the dub. It's the only way to properly take a look back at the show on even terms with our early memories of it. Yes, there are critical differences, but the dub adds additional charms that are often under-appreciated. Plus we don't have to look at Tai and Matt's naked asses. Seriously, did people really complain about that scene being cut? There are two addenda to this- seasons five and six. While Toon Disney served me well when Frontier came about, I no longer had it when Data Squad premiered. I originally watched that season entirely in Japanese, but I will be trying out the dub for the very first time when we get there. I'm also calling it Data Squad instead of Savers because Data Squad is slightly less stupid. As for Xros Wars... haven't seen it yet. Been meaning to, but I never got around to it. Thus, it will be my very first viewing of that season, which will be a completely different experience than our nostalgic look back at Tai and them. It'll also be the subtitled version unless a dub exists by then. I have perused some details of the season to get a feel for what it's about and for assorted season comparisons that crop up. Whenever I talk about “the other seasons,” I am including Xros Wars. Unless I'm wrong... then I'm not. Note that this applies to season comparisons, not characters. When I say something like “Matt is the coolest character ever,” for all I know Nene's got him beat by miles. Note that I do not actually think Matt is the coolest character ever. My goal is to post twice a week, usually on Monday and Thursday. If I'm really on my game and keeping up a good pace, maybe I'll throw an extra one on Saturday once in a while. I was going to start the week after next due to Anime Central, but I've already made good headway and Blogger lets you schedule posts. So check back on Monday for the thrilling beginning to Digimon Adventure! To give you something to get excited, here's season one's Japanese opening! Featuring what is still the best opening song, Butterfly! I will make sure to do this any time the animation changes. I'll post the first ending movie later on. Although that one's not close to the best ending song. On the dub vs sub issue, I actually have to say that with the Digimon anime, there's no definitive version that you ought to watch and stick with. Both versions are differing but unique and equally valid experiences of the same show. The original will often have better scripts, a more dramatic atmosphere, and some better music and voices, but the dub will have some genuinely great lines, some good music, great (or better) voices and performances, and an "Americanized" sense of fun and wonder that's lacking in the original. They're apples and oranges, really. Yes, Butterfly is the best Digimon theme song. I enjoy the dub opening just fine, but it really doesn't give the same adventure sense that Butterfly gives.